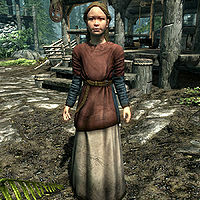 Dorthe is a Nord child who lives in Riverwood. Her mother and father are Sigrid and Alvor, respectively, and her cousin is Hadvar. She is friends with Frodnar, even though their families support opposing sides in the current civil war. Despite her mother's reservations about her boyish behavior, Dorthe can't be bothered and goes her own ways. After waking up at 6am she takes a quick one-hour breakfast, then leaves the house to play with her good friend Frodnar and his dog Stump. At 4pm she joins her father at his forge and acts as his 'apprentice' until they both go into the house for dinner at 8pm. After listening to her mother's complaints for four hours, she finally goes to bed at midnight. The only exception to this routine occurs when you first enter Riverwood and only if you escaped from Helgen Keep with her cousin Hadvar. She will then stay inside the house until you have spoken with Alvor. At the end of the discussion, she will insistently ask Hadvar: "Hadvar, did you really see a dragon? What did it look like? Did it have big teeth?" She wears a set of child's clothes and shoes and carries a copy of the house key along with a selection of food and toys. "Papa says I'm too friendly with strangers, but you seem all right." "My father is Alvor, the blacksmith. I'm his assistant. I mean, apprentice." "Some day I'm going to forge my own sword!" "Papa says I'm not ready for weapons. So I make lots of horseshoes and hobnails." "Mama doesn't think I'm girlish enough. But that's just stupid girl talk." "Papa may have wanted a son, but he got me. He's a lucky man." "Ain't nothin' a boy can do that I can't do better." Her mother Sigrid openly disagrees and will often discuss her daughter's whereabouts and boyish behavior with her husband (see this section). Additionally, when you speak with her, she will start out with what appears to be small talk: "Alvor and I, we got a daughter. Little Dorthe." and "My girl likes to work the forge with her papa. ", until finally revealing her concerns with, "All of that blacksmithing... It's not good for a little girl. Ain't... ladylike." "Oh, Dorthe. You're breaking your mother's heart, you know that?" 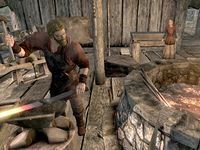 Occasionally, Dorthe will ask her father if she is ever going to be a great blacksmith. Sigrid "Dorthe, dear, I've been growin' some really lovely vegetables. Maybe tomorrow you could help me plant a new patch? What do you say?" "Dorthe... I was thinkin' I'd knit a couple of blankets, sell them to Lucan. Would you like to make one? Might be fun, workin' together." "You know, Dorthe, with all those vegetables I've been growing lately, I was thinkin' we could make a right lovely stew. Together. How about it?" Dorthe "Oh. Um. Well... You see..."
"Wow. Yeah. That sounds great, mother. Only, um... it's just that..."
"Oooh. Ahhh... Well... See, the thing is..."
Sigrid "Shor's crown! There are things ladies like us are supposed to do. We've talked about this..."
"Let me guess. You'd rather play "Daedra and Battlemages" with Ordnar. Or go fishing, or catch frogs..."
"Dorthe, listen to me. Your father and your friend may treat you like a boy, but you're not. Do you understand? So please. Be a girl. For me." Dorthe "It's just that papa promised I could make something at the forge. So maybe we could do something together, hmmm... next week? Is... that okay?" "Just stop trying to change me, mother! I'm not a baby anymore! I'm almost a woman! I... I can't be who I want to be!" "I'm sorry, mother. I can't help it. All that stuff you like to do, it's just so... boring." Alvor "Ho, now... Keep me out of this..."
Sigrid "Fine. You play in the mud, or play with your father's forge, or get into sword fights with your little friend. But this is not over." "Well. I can see your father and I are going to have to talk about this. And when we do, things are going to change." 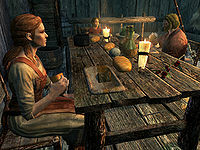 If you escaped Helgen with Hadvar, he will be flagged as a parent for Dorthe if Alvor and Sigrid are killed.